Rats eating GMO corn get tumors and die early, are we next? Did you know that about 90% of the US corn supply is Genetically Modified? Did you know that a study done looking at the long term effects of GMO corn on rats showed they developed horrifying tumors, widespread organ damage, and premature death? Did you know that this study has been deemed “the most thorough research ever published into the health effects of GM food crops and the herbicide Roundup on rats” and is the only lifetime study yet to be done on GMO foods!? Up to 50% of males and 70% of females suffered premature death. Rats that drank trace amounts of Roundup (at levels legally allowed in the water supply) had a 200% to 300% increase in large tumors. Rats fed GM corn and traces of Roundup suffered severe organ damage including liver damage and kidney damage. The study fed these rats NK603, the Monsanto variety of GM corn that’s grown across North America and widely fed to animals and humans. This is the same corn that’s in your corn-based breakfast cereal, corn tortillas and corn snack chips. If this doesn’t say enough I don’t know what does. GMO food is one of the biggest and most dangerous issues our society is currently facing. Unfortunately the studies promoting GMOs look at short-term effects (now we can see why). If this study above is the first one showing long term GMO effects, what does that say? Looks like GMOs have been forced into our food supply with limited research, and now we are becoming the lab rats. If these pictures depict anything close to what we are in store for we should all be alarmed. 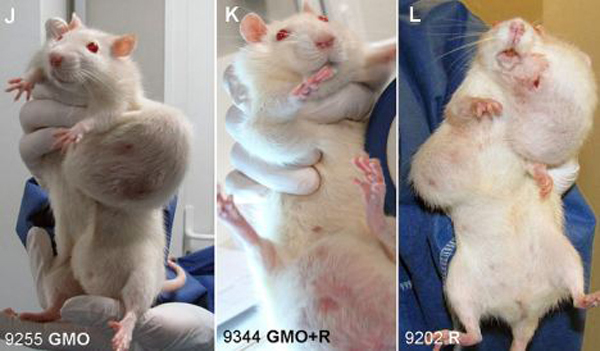 Avoiding GMOs takes time, but unless you want to end up like this rat, its worth your time. Do yourself a favor and before chowing down on some corn tortillas and salsa – check out this list on ways to avoid GMOs.